Some weeks as I am preparing for Sunday I read the gospel and I just immediately think to myself, “Well… Darn. That’s all about me. That describes my life.” Today’s gospel (Mark 6:30-34, 53-56) is one of those. And I’m betting it describes your life too. So I want to ask you two questions to see if today’s gospel fits your life the way I think it does. Here’s the first question. Have you ever made plans for your life? And here’s the second question. Have your plans ever been interrupted? Chances are you answered yes to both of those questions. We’ve all made plans. Maybe it was for an hour, a day, a weekend, a vacation, our work, our finances, our family. And we’ve all experienced the interruption of those plans by circumstances that changed or the unexpected that happened. Every one of us could probably say about today’s gospel, “Well… Darn. That’s all about me. That describes my life.” Today’s gospel describes the tension in which we live. And it’s the same tension in which Jesus and his disciples lived. The apostles have just returned from teaching, casting out demons, and anointing and curing the sick. They’re telling Jesus about everything they taught and did. He says to them, “Come away to a deserted place all by yourselves and rest a while.” He’s made plans and has some expectations of what will happen. A boat ride across the lake will take them to a quiet place and give them some time to rest and eat. Or so he thought. His plans, however, are interrupted by the many people who run ahead to meet him and the disciples as soon as the boat lands. His expectations are unmet. There is no quiet and there is no rest. There is only the great crowd of people, lost like sheep without a shepherd, interrupting what he had planned. Hasn’t that happened to you? The circumstances may be different but we all know what it’s like to have life interrupted. 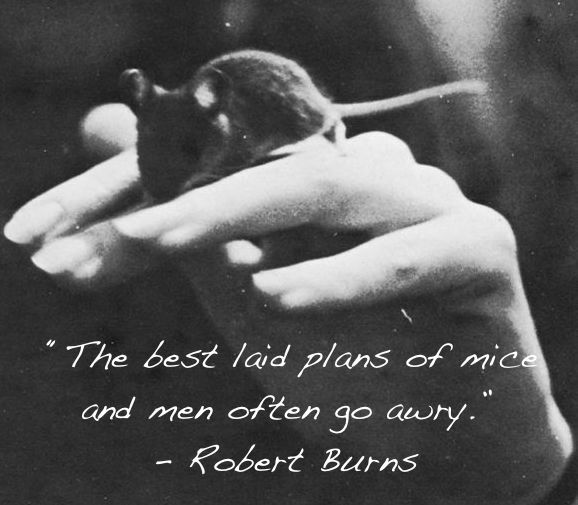 What’s that they say about “The best-laid plans of mice and men”? We all live in the tension between our plans and interruptions, our expectations and the unexpected, life as we want it to be and life as it happens. Every one of us could tell a story about that. It happens in small ways and in large ways. It’s the baby waking up early from what you thought would be a quiet hour, or a day that had nothing on the calendar that turns into a day of one thing after another. It’s taking a new job and finding that you are not doing what you planned and you are doing what you never expected. It’s the diagnosis that interrupts retirement plans. It’s a shattered dream, a divorce, a death. Our life plans get interrupted in a thousand different ways and the unexpected happens all along the way of life. I wonder what that looks like for you today. What are the plans or expectations you have for your life? And what are the interruptions or unexpected happenings with which you are dealing? Where is God in all of that for you? When our life plans are interrupted it’s easy and tempting to work even harder to make it happen, reinforce our boundaries, blame others, rage about things not working out, or pray that God will make it all go the way we want. Jesus doesn’t do any of that. He doesn’t turn the boat around when he sees the crowd. He doesn’t get angry or resentful. He doesn’t blame or complain. He doesn’t ignore or deny the interruption. He’s simply present to what is. We often hold our plans and the interruptions in opposition, as if it is one or the other. But what if it’s always both? What if one is not necessarily better or more important than the other? What if we could be equally present to the plans and the interruptions? What if we trusted that God’s spirit was present and moving in both? I don’t mean that God picks or causes one over the other but that within both the plans and the interruptions God is present and calling. I am not suggesting that we take a que sera sera attitude, that we give up planning, or that we just stop caring. What I am suggesting is that everyday life with all its plans and interruptions is our most important spiritual practice. Everyday life is where God shows up. It’s we learn about ourselves. It’s a school of love. It teaches patience and offers opportunities to soften our hearts and act with compassion. It invites us into the mystery of creation. How we relate to another mirrors our relationship to God. We learn to forgive. We practice faithfulness and hope amidst the uncertainty of life. That’s not to take anything away from prayer, study, outreach, charitable giving, going to church, or any of the other things we might think of as our spiritual practices. It’s to recognize that all those are about being in relationship and living everyday life. That means that we must learn to see more deeply and be more present to whatever is, whether planned or unexpected, desired or unwanted. Faithfulness is about being as intentional and caring toward the interruptions as we are to our plans. Isn’t that how Jesus lived? That’s what we see in today’s gospel. And throughout Jesus’ life. Remember the stories before today’s? Jesus and the disciples get in a boat and leave the crowds behind. A storm arises. Jesus is asleep. The disciples interrupt his nap. He calms the sea and the wind (Mark 4:35-39). As soon as they get across the sea and Jesus steps out of the boat he’s immediately met by a man with an unclean spirit. Jesus calls the spirit out of the man (Mark 5:1-13). They go back across the sea and he is again surrounded by a crowd. Jairus comes to beg Jesus’ help for his dying daughter. Jesus goes with him but then gets interrupted by the touch of the hemorrhaging women. She’s healed and Jesus continues on with Jairus. Messengers come to say it’s useless. The girl is dead. He raises the girl. (Mark 5:21-43) He goes to his hometown and teaches but is interrupted by questions and unbelief (Mark 6:1-6). And then we come to today’s gospel. It’s one interruption after another. All along the way Jesus is present and faithful to whatever and whoever is before him, whether planned or unexpected. That’s not just about tending to the lives of others. That’s also how we tend to our own lives. That’s how Jesus tended to his life. He knows the spirit of God “blows where it chooses” (John 3:8 ). That means we are always to be discerning the movement of the spirit in our lives, in plans and interruptions alike. What is that movement in the plans and interruptions of your life today? In what way is God present and calling in the midst of that? What do you see? What might be hidden at the intersection of your plans and the unexpected? Maybe there is always something of God hidden at that intersection. The feeding of the five thousand (Mark 6:35-44) and Jesus walking on the water (Mark 6:45-52) are hidden at the intersection of Jesus’ planned get away and the interruption by the crowd. The crowd that interrupted Jesus’ plans is the five thousand, “and all ate and were filled” (Mark 6:42). Those two stories, however, are not part of today’s lectionary reading. They fall between the first half of today’s gospel, Mark 6:30-34, and the second half, Mark 6:53-56. What if they were not omitted or excluded from today’s reading but were intended to be understood as hidden? What if abundance and nourishment, presence and reassurance, are somehow hidden at the intersection of our plans and interruptions? What if the fringe of Jesus’ cloak (Mark 6:56) is always being made available to us? Yes, we have hopes and desires for ourselves and our lives but let’s not lose sight that God also has hopes and desires for us and for our lives. This post is a perfect example of why, when my plans go awry that I have to think about that saying: If you want to make God laugh, tell him your plans. Absolutely. God surely has a good sense of humor. These stories speak to the miracles amid the mess of every day life. Jesus was performing miracles but his life was messy. He needed to rest. He was exhausted from helping. There were so many people in the crowds that they scarcely had time to eat. He was grieving because John the Baptist had just been buried. Then he performs the loaves and fishes miracle…Miracle! But the mess was that they were frightened by a ghost. Then he climbed in the boat and the wind stopped! The mess was that even his own disciples didn’t recognize him. Yes, I have made plans. Yes, they have been interrupted. And yes, life has turned out not as I have expected. Thank God that Jesus is with us through it all. May we have the grace and presence of mind and softness of heart to be present with him in the miracles and messiness of life. Well said Susan. Thank you. It’s good to see and be reminded that Jesus’ life was messy. Messy and God are not mutually exclusive. I hope all is well for you and your family. “Thank you for speaking the Word of God in “time” and out of time, too, by opening it, as far as you can see it’s meaning and implication for “today”. May God be praised and glorifies through your ministry at the heart of the Church. Struggling to “understand the SILENCE” of God, as well as His Word, alive and present, is an awesome challenge at any moment of life; and, can be so dark in the brightness of its revelation in the Present moment, it is the Cross of my own life. It is “GIFT” a PRESENT containing the ALL and the no-thing, the not-knowing which is also: Being still and knowing … “ I am loved with an Everlasting Love “ by the One who is Love! And, that takes total TRUST and the Grace of God, working together to the Glory of God-Trinity! a tiny bite or a huge one, who knows? Beautiful. Thank you. You describe the Mystery well – experience I am guessing.